Popular ramen chain Hakata Gensuke will open its first Perth outlet in mid-September, in East Victoria Park. Jason Lau and his wife Jaclyn Wong, who own the Perth franchise, has been a “ramen fanatic” since he was a boy and has travelled the world in pursuit of authentic ramen. He wanted to bring authentic tonkotsu ramen to Perth five years ago because he identified a demand here but the ramen shops he approached in other countries were not ready. Then he tasted Hakata Gensuke ramen in Melbourne three years ago and the dream of opening a store in Perth got closer to reality. 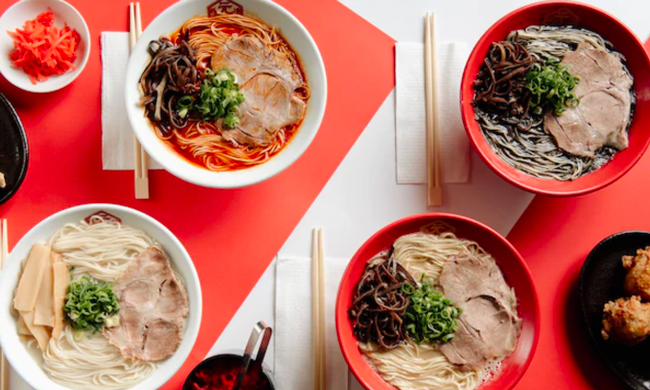 This involved numerous flights between Perth, Melbourne and Japan to discuss and research Perth’s ramen market, the most suitable location, the suppliers, equipment and staffing. The chefs also had to undergo stringent training at headquarters in Melbourne and Japan. Hakata Gensuke was created by chef and ramen champion Kousuke Yoshimura. Its authentic Japanese thin noodles in pork broth originated in Hakata, the central district in the bustling city of Fukuoka and the spiritual home of tonkotsu (pork bone base) ramen. The 30-seat restaurant has the same atmosphere and clean fit out as its counterparts in Victoria and Japan, with traditionally loud staff, quick service, big crowds, tight spaces and delicious ramen. There will be four ramen offerings, including the Tonkotsu, Black Tonkotsu, God Fire and Shio Tonkotsu. Supplementing the ramen menu are pork gyozas and Hakata-style fried chicken karaage.